Toothaches are enough to drive anyone mad, even more so when the cause remains elusive. Let us take a look at some of the most common culprits of toothaches so that you can tell when something’s wrong and figure out the best course of action. Tooth decay– Tooth decay is the usual suspect behind toothaches. The decay has to be significant enough for it to reach the inner layer (dentin) of your tooth. Once the dentin is damaged, then the tooth becomes sensitive, making it prone to cavities. If it reaches this stage, contact the dentist immediately. Tooth abscess – When tooth decay becomes advanced, it can end up affecting the root underneath and even infect the surrounding tissue. This causes pulsating pain that makes it difficult to determine which tooth is responsible for the pain. It’s quite serious and needs to be dealt with by a professional as soon as possible. Gum disease– This is often characterized by a dull pain, accompanied by bleeding gums. If left untreated, the gums, the teeth, and the bones will end up damaged, and surgical measures have to be taken to rid your mouth of infection. Tooth fractures– Teeth can be chipped or cracked in a lot of different ways, whether through a fall, a sports injury or biting on something hard and sticky. 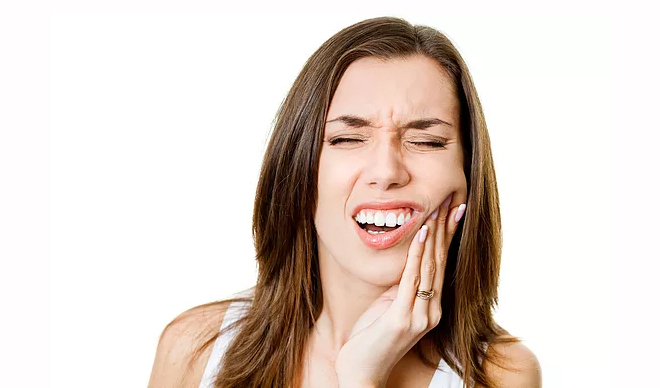 If the fracture makes its way to the middle of the tooth, then it will end up tickling the nerve endings which can cause excruciating pain. Temperature sensitivity – If you experience a sharp pain in your tooth during or after drinking or eating something that is hot or cold, then it is a telling indicator of tooth sensitivity. This means that the enamel has worn down, exposing the dentin. If you suffer from sensitive teeth, your dentist should be able to recommend a calcium based desensitizing toothpaste. Bruxism– Teeth grinding can cause tooth and jaw pain. People who regularly grind their teeth do so during sleep or when they are under stress. Excessive grinding involves violent jaw clenching and grinding the upper and lower teeth back and forth against each other. This can lead to sore joints and jaw bones, headaches, and even chipped or cracked teeth, all of which are quite painful. The best way to treat it is to wear a custom mouthguard when you go to sleep. ⟵Electric brush or manual brush ?